ETH-USD failed to break overhead resistance in the $160 range. This coincided with a failed retest of the supply and demand channel as the market saw a strongly overbought condition. We are currently stuck between support and resistance, but it seems very likely that we will see a retest of the low $90s before any potential bullish pressure hits the markets. If, for whatever reason, we begin to rally, we need to see a decisive, strong close above the $160 level before any macro-trend-changing behavior is seen. After a tumultuous drop followed by an encouraging rally, the ETH-USD has, yet again, found itself bleeding out and giving up all of its previously hard-fought gains. At the time of this writing, the market has failed to break through two macro trends: its descending supply and demand channel and its historic overhead resistance. The figure above shows a macro descending channel that has governed much of the market for approximately the last year. This type of channel, known as a “supply and demand channel,” is a tool used by some market analysts to determine roughly overbought and oversold conditions in the market. The top of the channel represents an overbought condition, and the bottom of the channel represents an oversold condition. A decisive break of the channel would represent potential trend-changing behavior and could even signal that a potential reversal is inbound. However, after showing an overbought signal for several days, the ether market took a sharp turn downard that now has us testing deeper support. 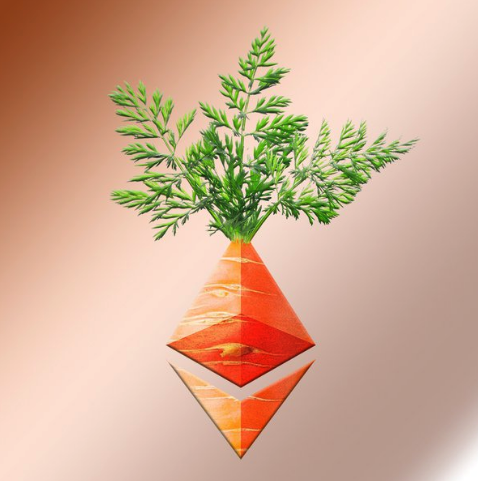 For now, the ETH-USD market doesn’t exactly seem the most appetizing, as every single rally over the last few months has been easily stifled by bearish pressure. Due to the overwhelming evidence and lack of overall bearish pressure, I’m inclined to argue that the most logical destination for the current move is a retest of the support in the upper $80 range. We will have a lot more information if we see how the market reacts at this level. If, for whatever reason, we break this support in the $80s, we can expect a deeper test of lower lows and will likely find support in the upper $30s to lower $40s. The weekly chart shown in Figure 3 outlines major support and resistance areas that are likely to either see strong bearish or bullish respect. 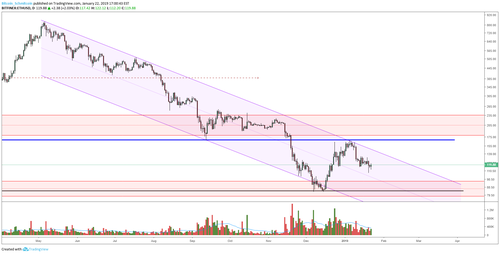 However, if we can manage to gather up enough demand in the ETH-USD market, we will likely see a retest of the $160s before any significant selling pressure comes to fruition. From there, if we manage to break through the overhanging resistance, the bulls will still be put to task as there is a strong band of overhead resistance lying just above the thick blue line shown in Figure 3. Overall, things are looking fairly bearish for the ETH-USD market. We are kind of stuck in the middle of support and resistance on a macro level, so it wouldn’t be entirely surprising to see a couple more weeks of choppy, unproductive market behavior. Trading and investing in digital assets is highly speculative and comes with many risks. This analysis is for informational purposes and should not be considered investment advice. Statements and financial information on Distributed.com and BTC Media related sites do not necessarily reflect the opinion of BTC Media and should not be construed as an endorsement or recommendation to buy, sell or hold. Past performance is not necessarily indicative of future results. The International Monetary Fund (IMF) and the World Bank have launched a permissioned blockchain-based "educational" digital token called Learning Coin. The token is inaccessible to the public and has no monetary value, but was developed to help agency staff becomes familiar with the principles behind distributed ledgers and cryptocurrencies.